I really don't care for red sauce lasagna, but of course I will eat it along with any other Italian food I make or can get my hands on. 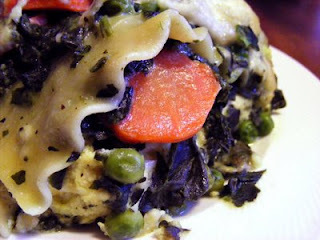 This vegetable lasagna recipe I have tried several different ways and think this is the best over all. We are having this with Caesar salad and homemade cheese bread. Soo good on a cold winter's day, did I tell you winter is back on Beaty's Creek? Yep, showed up last night for a few days. I would love to have snow but I hate cold with no snow, it is the kid in me I guess. Nothing says winter fun like doing donuts in the snow in a Ford pick-up truck. Good times I tell you. Now on to the recipe. Melt butter and add flour. Stir constantly until golden brown, now add 6 cups of milk slowly all while stirring. When it thickens up a little remove from heat. Mix together all of the veggies with garlic, salt, and pepper. Mix ricotta, eggs and Parmesan cheese together until creamy. Mix ricotta, eggs and Parmesan cheese together. Mix well. Bake at 400' covered for 45 minutes, remove cover and bake for 20 more minutes. Let cool for 15 minutes and serve. This sounds like incredible comfort food...great for this time of year. Thanks for sharing!